Since the introduction of kayak fishing hand paddles, paddle sports, particularly the sports of kayak fishing, hunting and photography has embraced these simple, yet indispensable paddling accessories with open arms. 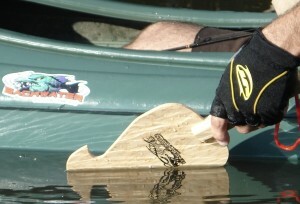 Having open arms, at least free hands, while fishing, hunting of taking pictures is what every paddle sportsman desires. Paddle sportsmen want to focus on one thing and one thing only. They want success in getting close enough to catch, capture or photograph their prey. The last thing a paddle sportsman wants to do is scare their prey away, or not be at the ready, before they have the opportunity to perform. Kayak fishing hand paddles make it much easier to keep fishing, hunting or your subject within the camera view finder without spooking your elusive prey. The problem all paddle sportsmen encounter is how to stealthily maneuver their boat within close proximity while still accomplishing their mission! Compact and lightweight, kayak fishing hand paddles allow you to stow those bulky, seven foot kayak paddles. Simply keep an eight ounce kayak fishing hand paddles between your legs, or within easy reach, and with one hand, stealthily move your boat to within range without ever setting down your fishing rod, gun or camera. Now you can easily fish, hunt and photograph while moving your boat! Previously, the kayak sportsman got as close as he could with his seven foot kayak paddles. Once on target, he commenced to do what he came to do. As we know, wildlife becomes very skittish when man, whom they view as a predator, enters their protected domain. The natural tendency of wildlife is to move away from their predator, with stealth if possible. The more action you provide in your approach, the faster and further they flee. Wildlife often watch with intrigue as you approach from a distance, however, encroaching into their fight or flight zone, wariness ensues. Flailing seven foot kayak paddles while in close proximity to wildlife is tantamount to certain failure. They will soon be gone. Kayak anglers continually find it necessary to stealthily move their kayak short distances to stalk their prey. Fish are always on the move. Facing a common dilemma as how to keep fishing, move your boat and not scare prey away, became problematic. Having to break out their seven foot kayak paddle and lay down their fishing rod just to move their kayak a few yards put them in jeopardy of losing sight or frightening away their prized lunker. Fish have eyes, and believe me, those eyes are always looking for predators. No matter how stealthy you are while flailing seven foot kayak paddles, it is surely to grab their attention and send your prize darting away. Duck hunters find kayaks as the ultimate method of quietly sneaking across lagoons, lakes or ponds. Getting your boat situated in the reeds or cat tails, sliding into a blind or silently slithering along the surface is paramount to successful duck hunting. Turning your boat for the correct presentation to aim your gun without sending the flock flying is easier said than done. Again, having to break out your seven foot kayak paddle and setting down your gun to attempt a stealthy maneuver without scattering the flock is a challenge most duck hunters wish to avoid. Water fowl, shore birds and marine mammals live in a very dynamic environment and are particularly hard to photograph unless you have a plan, or a huge telephoto lens. Kayak photography has taken off as the innovative method for obtaining those natural habitat photos of wildlife. Half the battle of getting that perfect photograph is being in the right place at the right time. Paddle sportsman, particularly paddle photographers, are taking advantage of the stealth that kayaks provide in locating and snapping that once in a lifetime shot. However, just like fish and ducks, marine wildlife is easily spooked by flailing objects. Breaking out those seven foot kayak paddles to maneuver closer for your shot is a guarantee that your subject will be spooked. Photograph missed. 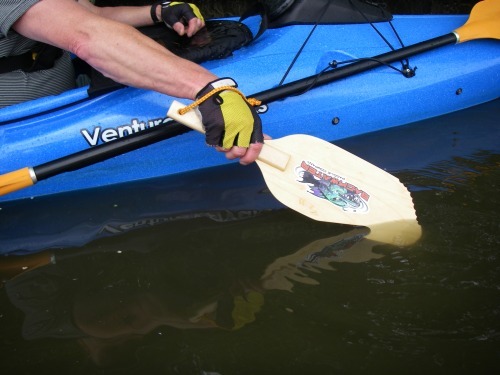 Kayak fishing hand paddles provide the ultimate opportunity for paddle sportsmen to stealthily maneuver their boat in any scenario. Whether you are kayak angler, duck hunter, or paddle sports photographer, having the capability to stealthily maneuver your boat determines whether you become a player or get skunked. Kayak fishing hand paddles simply allow you to put away those awkward kayak paddles, stealthily move your kayak one-handed and successfully keep fishing, hunting of shooting photos. Until they figure out how to make a small kayak motor powered by one of the best rv house battery reconfigured for the sport, I will pass thank you. I’m just not the rowing type. This entry was posted in Backwater Paddle Products and tagged fishing, kayak fishing, kayak fishing hand paddles, kayak paddles, kayaks, paddle sports, wildlife photography on December 16, 2010 by Paddleman.